This list honestly probably could have been 100. Choosing 10 storylines for the 2018 Masters is like choosing a single March Madness memory as your favorite. Sitting there on the fringes of each list are a plethora of other choices that are so good that not only could they make the cut, they could top it. But because scarcity creates value (or so I was told in college economics), I've limited myself to 10 narratives as jumping off points for the 82nd Masters. Most are obvious (hello, world), but some might not be if you haven't been paying attention for the last few months. Let's start where we always start when it comes to golf and the Masters, the Big Feline's den. 1. 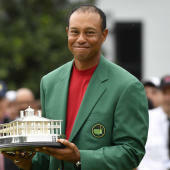 The final piece of Tiger Woods' Masters comeback: So far we have seen Woods compete in five different events this year. He has truly contended in two of them and scared the top of the leaderboard in two others. I haven't seen anything to prevent me from thinking that he can vie for (and feasibly win) a major championship, but with this appearance at Augusta National, the comeback resume will officially be complete. If Woods becoming the Vegas favorite for this tournament is startling, the fact that he hasn't won a green jacket in nearly 15 years should be even more so. Not that he hasn't had chances. Since beating Chris DiMarco in 2005, Woods has seven (!) top five finishes. However, he has only played this tournament one time since 2013. That was 2015 when he finished T17. Tiger has been a total thrill so far in 2018, a far cry from what many of us (probably including him) thought he would be in his return. It's not that I didn't think he would be good -- his institutional knowledge of this sport is worth several strokes per tournament -- it's that I didn't think he would be averaging over 300 yards off the tee and be ranked third on the PGA Tour in club head speed. The short game is tidy, too -- Woods is ranked in the top 20 in strokes gained around the green and with his putter. Thus far in Woods' comeback, it hasn't really mattered that he hasn't won. It's only mattered that the on-ramp to Augusta has been rife with green lights all over the place. Now all of a sudden it does matter that he wins. Not to you, maybe, and certainly not for the television ratings. But for him it matters. A lot. 2. Phil Mickelson is almost 50: Lefty is trying to match Tiger with his fourth green jacket, and he would be the oldest Masters winner ever, usurping Jack Nicklaus' iconic win in 1986 at the age of 46. The 47-year-old Mickelson is having (arguably) his best season in half a decade and already has a win under his belt (a belt that has a logo of himself jumping in the air after a Masters win, mind you). Mickelson has gotten increasingly streaky at this tournament as he's gotten older. He has two missed cuts in the last four years after incurring just one in the previous 19. But I think he thinks nobody has a chance if he's locked in. He might be right. 3. Jordan Spieth's to lose? I stand with Chris Solomon of No Laying Up. The next 20 Masters are Spieth's to lose. Will he lose most of them? Yes, he will. But he should also win a couple, if not a handful. There exists an alternate reality in which Bubba Watson's drive on the 13th hole in 2014 goes three yards left instead of right where Spieth is coming into this tournament having won three of the last four Masters. His putter has been shakier than a Markelle Fultz 3-pointer so far this spring, but Magnolia Lane is Spieth's "Chronicles of Narnia"-like wardrobe. When he enters, anything can happen. 4. Rory McIlroy going for the slam: Hello there, my golf-watching friends. I'm here to remind you that Rory is trying to become the sixth human being in the history of this good planet to ever win the U.S. Open, Open Championship, PGA Championship and Masters. This is somehow (somehow) flying under the radar, even though McIlroy won in March and has four straight top 10s at this tournament. I promise you it won't be if he goes out and shoots 66-67 on Thursday and Friday. 5. Justin Thomas to No. 1? Thomas said after the WGC-Dell Technologies Match Play that he was thinking so much about becoming No. 1 that he couldn't focus on playing his semifinal match against Bubba Watson. Good, I'm glad he has that out of his system. He has a chance this week to take his second straight major championship and become the 21st golfer to ever lay claim to "best player in the world" status. That is, as our esteemed former Vice President might note, a big ... deal. 6. Justin Rose's revenge: This probably leans more toward the golf nerd side of things, but Rose has the gas pedal down right now. He has two runners up in the last three years here and has a ridiculous number of top 10 finishes in his last 16 starts worldwide. After losing in a playoff to Sergio Garcia last year, taking a jacket this year would be sweet revenge. It seems a little too obvious, though, to pick the guy who has finished, on average, 10.6 on the leaderboard here in the last five years. Also, just for fun, I always enjoy looking at how nicely Augusta would fit into Rose's resume. Here are the courses where he's won. Sweet mercy, that's a list. 7. Bubba's hovering: Watson is either going to miss the cut catastrophically or win by six, I'm convinced of it. With two wins already this season and bend on his driver than one of Bryson DeChambeau's physics experiments, he has to be considered one of the favorites. In his last eight starts here, Watson has two wins and six finishes outside the top 30. 8. Somebody's first? A ridiculous list of top 20 golfers who have never won a major championship. I'd take this team against your best 10 from either the U.S. or European Ryder Cup teams this year. I'd lose, but it's still a really good squad. And somebody from it could grab major No. 1 at Augusta National this week. 9. Old vs. New: I don't know know exactly how this is going to play out (or even how I want it to play out), but barring a Tiger-Phil duel that none of us would live through, I'd love to see one of the old lions taking on the generation they made. Tiger facing Thomas in the final pairing on a Sunday. Lefty with Rose in the penultimate group in front of McIlroy and Spieth. I've written this probably 25 times this year, but there is little (if anything) as compelling as one of the all-time greats trying to absorb haymakers from a currently-in-his-prime great. I don't care what the permutations are. I just want to see it. 10. Can Sergio Garcia repeat? We're 10 deep and have yet to mention the defending champion here, Sergio Garcia. It's still a crazy reality that Garcia's first major championship came at Augusta National (of all places! ), and I don't really think he can win again. But a repeat champ (which hasn't happened since Woods in 2001-02) is always a dream, and even more so when it's one of the most polarizing golfers of the last 20 years.